Loyola University New Orleans has begun live webcasting of select College of Music and Fine Arts performances, providing access to the events to viewers from around the world. Under the guidance of John Snyder, the Conrad N. Hilton Eminent Scholar and chair of Music Industry Studies, and Artist House Music, the CMFA launched its first live webcast with the Loyola Symphony Orchestra concert on Saturday, April 18. The webcasts are produced by the Center for Music and Arts Entrepreneurship, which provide video production, in conjunction with the Roussel Hall production crew and the student entrepreneurship recording studio, Nola Sound. 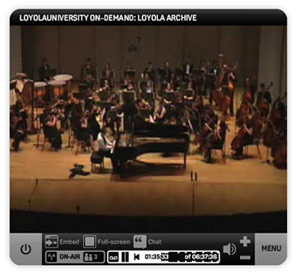 In addition to live content, the new webcasting capabilities will also allow viewers to watch past Loyola performances on demand. Video selections include opera, symphony and jazz performances, concerts, masterclasses, forums and faculty interviews. This content can be viewed anytime by using the video player’s on-demand feature. To view live webcasts and the on-demand video library, visit the CMFA website at http://cmfa.loyno.edu/montage/webcast. Loyola Ballet Spring Performance – Friday, April 24, 8 p.m.
Loyola Choirs Concert – Sunday, April 26, 7:30 p.m.
Music Industry Studies Forum with guest Harold Battiste - Monday, April 27, 5 p.m.
Loyola Opera Theatre Presents Henry Purcell's "Dido and Aeneas"– Monday, April 27, 7:30 p.m. The Complete Prokofiev Piano Sonata Series, Part 3, featuring Loyola professor and pianist John Murphy – Tuesday, April 28, 7:30 p.m.
Loyola String Orchestra and Small String Ensembles – Wednesday, April 29, 7 p.m.